Received July 16, 2018; Revised September 20, 2018; Accepted September 21, 2018. 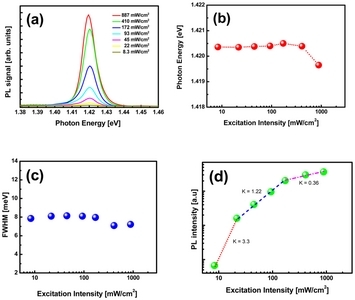 Optical properties of InAs/GaAs submonolayer-quantum dot (SML-QD) have been investigated using excitation intensity (Iex)- and temperature-dependent photoluminescence (PL). At a low temperature (13 K) strong PL was observed at 1.420 eV with a very narrow full-width at half maximum, of 7.09 meV. The results of the Iex dependence show that the PL intensities increase with increasing Iex. The enhancement factors (k) of PL increment as a function of Iex are 3.3 and 1.22 at low and high Iex regime, respectively. The high k value at low Iex, implies that the activation energy of the SML-QDs is low. The calculated activation energy of the SML-QDs from temperature dependence is 30 meV. Owing to their high absorbing capability near the infrared (IR) wavelength regime, InAs/GaAs quantum dots (QDs) are considered as suitable candidates for fabrication of high-efficiency intermediate-band solar cells [1–4]. InAs/GaAs QDs are mostly formed by Stranski-Krastanov (SK) mode . However, in S-K growth mothod, strain-related defects caused by interface strain between InAs and GaAs are unavoidable. Defects act as carrier trapping and recombination centers, resulting in degradation of the optical properties and current transport performance [6,7]. In S-K method of growing QDs, a wetting layer (WL) is formed and electrons are missed into a wetting layer rather than a quantum dot. This problem reduces the open-circuit voltage of the solar cell. For these reasons, it is important to suppress a defect generation and to maintain the crystal quality of QDs without WL formation to achieve high performance of devices. Recently, in attempts to fabricate defect–free QDs, InAs QDs with low defect density caused by strain, sub-monolayer (SML) deposition method has been suggested as an alternative method for the SK growth mode [8–10]. In principle, the SML growth process consists of InAs SML of thickness less than 1.0 monolayer (ML), while conventional InAs SK-QDs are typically formed by depositing over 1.7ML (critical thickness in S-K mode) of InAs on the lattice-mismatched GaAs surface [9,11,12]. Since the size of quantum dots formed in the SML-QD method is smaller than that of the S-K method, the carrier escape efficiency is improved and carrier transportation is facilitated . In this study, we investigated optical properties of InAs/GaAs SML-QD using photoluminescence (PL) with various excitation intensities and temperatures. Figure 1 shows a schematic sample structure of the InAs/GaAs SML-QD samples used in this study. Samples were grown on a semi-insulating (SI) GaAs (100) substrate by a solid source molecular beam epitaxy (MBE) system. An undoped-GaAs buffer layer of thickness 400 nm was grown on the SI-GaAs substrate. To form a SML-QD, a 0.5ML thick InAs layer was grown on the GaAs buffer layer and then 2.5ML thick GaAs layer was employed to cap the InAs layer, this sequence was repeated 5 times to form a SML-QD. After formation of the SML-QD, 10 nm-thick GaAs layer was used as a spacer layer. 8 periods of SML-QD layers were formed. 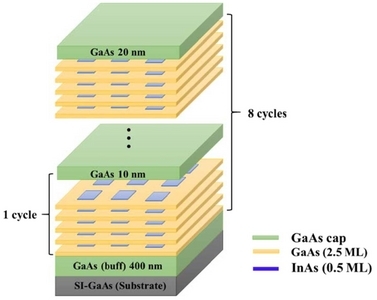 Each period of the SML-QD layer consists of 5 cycles of InAs (0.5 ML)/GaAs (2.5 ML) and is covered with a 10 nm-thick GaAs layer. For PL experiment, a laser diode (637 nm) was used as an excitation light source with its light incident on the sample surface. The excitation intensity (21.6~886 mW/cm2) was controlled using a neutral density filter. The PL intensity as a function of emission wavelength was measured using a Si detector. Figure 2 shows low temperature PL spectra of InAs/GaAs measured at a temperature of 13 K under excitation intensity (Iex) of 8.3 mW/cm2. The PL peak is observed at 1.420 eV for InAs/GaAs SML-QD with the 7.09 meV full-width at half maximum (FWHM) as shown in the inset. Han et. al. reported 1.7ML S-K QD has ~50 meV of FWHM in the change of FWHM of PL spectra for InAs QD size distribution . In this study, the SML-QD has significantly narrow FWHM, which implies that the SML-QD has high uniformity of size. To investigate the effect of Iex on the properties such as PL intensity, peak shift, and FWHM, on SML-QDs, Iex-dependent PL was performed with various intensities (8.3 ~1,666 mW/cm2) of incident light at T = 13 K and the results are shown in Fig. (a)-(d). Figure 3(a) illustrates that the PL peak shifts to lower energy for Iex > 410 mW/cm2 and the PL intensity gradually saturates as the value of Iex increases. The position and FWHM of the PL peak as a function of the Iex are shown in Fig. 3(b) and 3(c) to confirm the above. A little red-shift of ~0.74 meV is due to the increase in recombination of relatively larger QDs and low energy QDs, by the process of escape and re-trapping of the excess carriers inside the QDs. The value of FWHM remains constant for a considerable intensity regions. The constant FWHM for a large intensity region implies that the SML-QD has high uniformity. In the PL spectra, the emission intensity increases with Iex, and the slope of the emission intensity-curve depends on the origin of the emission . The intensity of a spontaneous emission by an intrinsic transition, such as the interband and the exciton transitions at the PL spectra, is proportional to the natural logarithm of Iex when the origin of emission is operating independently and there is no reciprocal movement of the carrier. Figure 3(d) depicts the intensities of the peak as a function of Iex at T = 13 K. The relationship between Iex and the emission intensity in the PL signal can be expressed as follows . where, k is the emission coefficient, IPL is the emission intensity, and Iex is the excitation intensity. 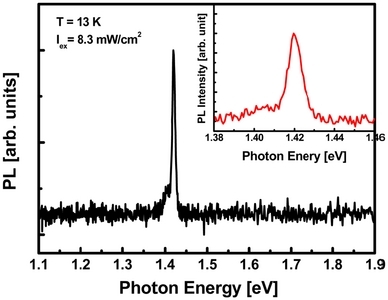 Emission related to the exciton gave 1 < k < 2 for the excitation intensity dependence. In addition, the emission related to limited energy states gave k < 1. In the intensity region below 22 mW/cm2, the value of k is 3.3. In the region from 22 to 172 mW/cm2, the value of k is 1.22, similar to that for an exciton transition. In the region above 172 mW/cm2, the value of k is 0.36, which is similar to that for a defect transition. Generally, the QDs with high barrier height, in which case the size of the QDs is large, gave k = 1 . However, in the case of QDs with low barrier height, slope of k is not linear but exhibits a superlinear dependence. At lower Iex, when the escape of the carrier inside the QDs is easy, the value of k is greater than 1 because the escaped carriers do not contribute to emission of the QDs as the phenomena of escape and re-trapping of the electron and hole are independent . However, this superlinearity becomes weaker with increasing Iex and approaches linearity (slope of 1) at the high intensities. With further increase in the value of Iex, the states of the SML-QDs are easily filled because the sizes are smaller than general QDs grown by S-K method. Hence, the carriers, which are confined to the QDs, can escape easily and move to other states. Therefore, the recombination rate decreases inside the QDs thus decreasing the value of k. In the case of high Iex, most carriers escape, and the recombination rate inside the QDs is further reduced. To confirm our assumption, that the barrier height of the SML-QDs is low,s the temperature-dependent PL measurements were performed. The integrated PL intensity as a function of reciprocal of temperature is depicted in Fig. 4(a). The measurements were performed with a laser excitation power of 887 mW/cm2. The activation energy of the QDs can be determined from the PL signal, as shown in Fig. 4(a). The change in the integrated PL intensity with temperature is given as follows . where, I0 is the intensity at T = 0 K. Ea and kB are the binding energy and Boltzmann constant, respectively. C is proportionality constant. As expected, the activation energy of the SML-QDs from the fit was 30 meV. This value of 30 meV is sufficiently smaller than the value of 225 meV of the S-K QDs . This lower activation energy value of the SML-QDs promotes photo-generated carrier escape. The temperature-dependent FWHM of the PL spectra is depicted in Fig. 4(b). The value of FWHM increases with increase in Iex value because the escaped carriers can contribute to the emission of smaller or larger QDs into the surroundings. The rapid increase the FWHM at T = 160 K is due to increase in escape by the low activation energy. Iex and temperature-dependent PL spectra of InAs/GaAs SML-QD have been investigated. At low temperature (13 K) strong PL was observed at 1.420 eV with very narrow FWHM of 7.09 meV. The result of the Iex dependence showed that the PL intensities increased and finally saturated with increasing Iex. The value 3.3 of k, below 22 mW/cm2 intensity is reduced at higher intensities due to a decrease in the escape and re-trapping effects. In the intensity region above 172 mW/cm2, the states of the SML-QDs are easily filled, so most carriers escape, and the recombination rate inside the QDs is further reduced. The activation energy of the SML-QDs obtained from the temperature dependence was 30 meV. This lower activation energy of the SML-QDs aids the escape of the photo-generated carriers. This research was supported by Basic Science Research Program through the National Research Foundation of Korea (NRF) funded by the Ministry of Education (NRF-2017R1A6A3A11028070). This work was supported by the National Research Foundation of Korea (NRF) grant funded by the Korea government (NRF-2018R1D1A3B07050824). Fig. 1. Schematic structure of InAs/GaAs SML-QDs. Fig. 2. PL spectra of InAs/GaAs SML-QD at 13 K.
Fig. 3. (a) PL spectra with various excitation intensity, (b) excitation intensity-dependent PL peak shift, (c) excitation intensity-dependent FWHM of PL spectra and (d) PL intensity as a function of excitation intensity of InAs/GaAs SML-QD at T = 13 K.
Fig. 4. (a) PL intensity as a function of reciprocal temperature and (b) temperature-dependent FWHM of the PL spectra. Sablon, KA, Little, JW, Mitin, V, Sergeev, A, Vagidov, N, and Reinhardt, K (2011). Nano Lett. 11. Han, IS, Smith, RP, Kim, JS, Noh, SK, Lee, SJ, Lee, CL, and Leem, J-Y (2016). Sol Energy Mater Sol Cells. 155. Martí, A, Antolín, E, Cánovas, E, López, N, and Luque, A . ., Proceedings of the 21st European Photovoltaic Solar Energy Conference, Sept. 4–8, 2006, Dresden, Germany, pp.99-102. Nasr, A (2013). Optics & Laser Technology, 48. Joyce, PB, Krzyzewski, TJ, Bell, GR, Joyce, BA, and Jones, TS (1998). Phys Rev B, 58. Willis, SM, Dimmock, JAR, Tutu, F, Liu, HY, Peinado, MG, Assender, HE, Watt, AAR, and Sellers, IR (2012). Sol Energy Mater Sol Cells. 102. Wu, J, Jiang, Q, Chen, S, Tang, M, Mazur, YI, Maidaniuk, Y, Benamara, M, Semtsiv, MP, Masselink, WT, Sablon, KA, Salamo, GJ, and Liu, H (2016). ACS Photonics, 3. Krishna, S, Zhu, D, Xu, J, Linder, KK, Qasaimeh, O, Bhattacharya, P, and Huffaker, DL (1999). J Appl Phys, 86. Xu, Z, Birkedal, D, Hvam, JM, Zhao, Z, Liu, Y, Yang, K, Kanjilal, A, and Sadowski, J (2003). Appl Phys Lett, 82. Germann, TD, Strittmatter, A, Pohl, J, Pohl, UW, Bimberg, D, Rautiainen, J, Guina, M, and Okhotnikov, OG (2008). Appl Phys Lett, 92. Kresnikov, IL, Ledentsov, NN, Hoffmann, A, and Bimberg, D (2001). Phys Stat Sol (a), 183. Ledentsov, NN, and Bimberg, D (2003). J Crystal Growth, 255. Kim, Y, Ban, K-Y, and Honsberg, CB (2015). Appl Phys Lett, 106. Schmidt, T, Lischka, K, and Zulehner, W (1992). Phys Rev B, 45. Le Ru, EC, Fack, J, and Murray, R (2003). Phys Rev B, 67. Lee, KS, Oh, G, Kim, EK, and Song, JD (2017). Applied Science and Convergence Technology, 26.